Here’s my first image posted to “Yes to Know.” I took this picture in April in the Great Smoky Mountains Forest just over the mountain from where I grew up. When I was little these ferns (called “Fiddleheads” or “Christmas ferns?”) grew all along the mountain next to our house. 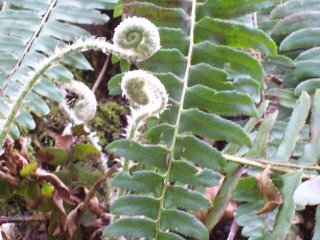 I’d see these strange little swirls pop up each spring around the green and brown bracken. They aways seemed almost animal like as they unfurled into hearty ferns.